Tune into 89.7 WTMD and discover music that’s off the charts. WTMD delivers a roster of talented, independent artists who otherwise get lost in the noise of commercial radio. If you’re looking for challenging and thought-provoking music from today’s innovative artists, including The Alabama Shakes, My Morning Jacket and Radiohead, then download this app today. You’ll hear sonically cohesive sets programmed by the WTMD DJs in Baltimore. Every day our jocks bring you deep tracks, new cuts and interviews from artists changing today’s social scene. You’ll find special programs highlighting the achievements of bands and artists in the Baltimore region, folk and world music, cutting edge alternative, contemporary blues, deep dub reggae, and down’n dirty soul. 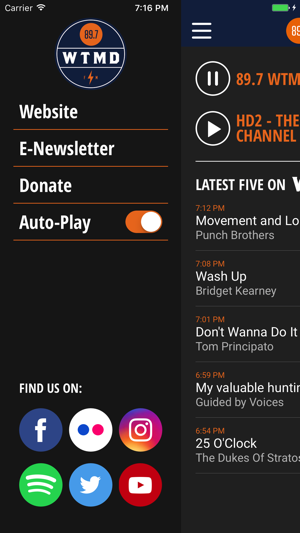 Complete program schedule at wtmd.org. 89.7 WTMD. Building a better Baltimore, one song at a time. 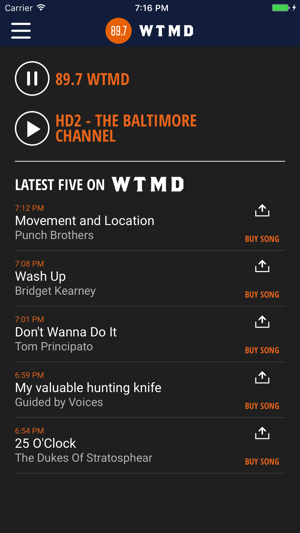 WTMD is a public service of Towson University. I listen to this station all day at work, over the air, so I think the station itself is great. I was going to rate the app lower, because the HD-2 stream hasn't worked in the week since I loaded the app. However, I just tried the HD-2 stream on a Logitech Squeezebox, and it doesn't seem to be working at all--so that's not the app's fault. The main station lately has had way too much sports (boring!) whenever I try to use the app, but what I have heard sounded good. Note to app creator: There is a typo in the app. When the HD-2 stream is selected, the app tells me I'm listening to WTDM, instead of WTMD. Granted, with that stream not working, it may indeed be "tedium" (TDM), but this should be fixed. Respecting the elderly while craving new material! As a former news writer and broadcasted musician of the Towson's former station in the late 80's, I enthusiastically promote this app. This is an excellent resource to tap into new and interesting media and a great way to keep in touch with the school that elevated your lifestyle through new friends and mostly memorable experiences. Let's face it, good and bad memories don't always advance themselves to top-shelf memory clusters. Funny how, though, that good music has a way of jarring said memories. Give this app a try - you won't be dissappointed.